Mary Kay... Who doesn't know the brand? Over 50 years, Mary Kay has sold their products worldwide with more than 200 active independent National Sales Director, and the company's global independent sales force exceeds 2 million. Mary Kay's products wholesale sales exceeds USD1.7million each year. Mary Kay has always been a big number achiever. But this year, they are looking for one... only one girl to be the cover girl in Asia in conjunction with their 50th anniversary. To find out how it works, the prizes, rules and regulations, please head to www.makeovercontestmarykay.com . Basically it is very simple, make an appointment with Mary Kay independent beauty consultant for a makeover. Take photo of yourself, and upload the photo. It's that simple!!! Mary Kay has beauty consultant every where in Malaysia. So, you can participate this contest wherever you are. 5 winners will be able to join a fun and fabulous 4 days 3 nights trip to Hong Kong and be trained as Asia's Top Model. 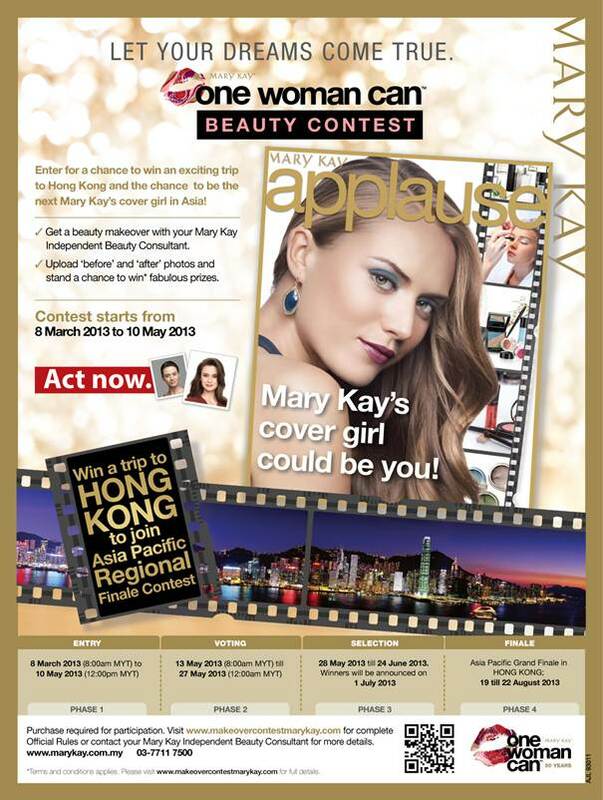 And 1 winner will be crowned as Mary Kay Cover Girl in Asia. I really hope to win this contest because I'm getting excited over the starstudded event in Hong Kong. There are so many pretty girls out there who deserve to be the cover girl, so I don't wish to win it. I just hope I can join the once-of-a-lifetime event in HK. Anyway, if you're a blogger, do take part in announcing the contest. You will be able to receive 1 mini Targeted Action Body Lotion and Mini Hand Cream in mesh bag and 1 Nourishine Plus Lip Gloss. And if you participate in the Blog Challenge, the Top 10 blog posts will be able to win RM1,000 worth of products from Mary Kay (I hope there's lipstick in it. Mary Kay's lipsticks are awesome!!!). And 2 best and most creative blog post will be selected to join a 3 Days 2 Nights trip to Hong Kong for the Grand Finale event with the contest winners. Wooooohoooo!!!!!!!!!! I really can't wait to join it because I'm getting really excited over the prize. Everyone please pray for me and wish me luck!!! Don't forget to join the contest too!!! Maybe we'll both win and travelling to HK together. Yeeeeehhhhaaarrr!!!!! good luck :) I hope you win it! Wish u all the best! ! Thank you everyone! I wish you all luck too!